What could be more fun than catching a hard fighting, high jumping gamefish on light tackle? Well, catching them two at a time would, of course. 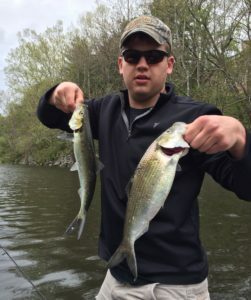 While hickory shad are not the biggest fish out there, their vigor, cooperative spirit, and sheer numbers make them fan favorites. Hickories provide spring fun for anglers in coastal rivers up and down the eastern states, and tandem rigging makes it even better. 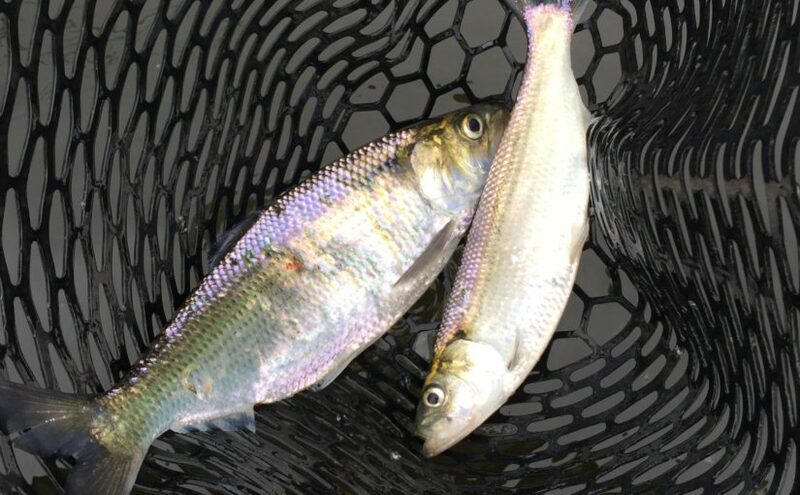 An anadromous species, the hickory shad spend the majority of their life in saltwater. They migrate into freshwater rivers only to spawn. Those that survive return to the salt shortly thereafter. We fishermen most often intercept them at or near their spawning grounds. Tandem rigs are the name of the game for hickories. This my current tandem rig. Start with a Perfection Loop or other reliable loop knot at the end of your line or leader. Then about a foot or two above that tie in a Dropper Loop. Using two loop knots allows me to easily add, replace, or remove lures as the fishing conditions dictate. One more note about rigging: if you are using a landing net, don’t make the separation between loops greater than your net’s hoop diameter. I figured this out the other day when we had about 30 inches between lures and only 18 inches of net. If we netted the top fish, the bottom fish had an extra foot of leader to evade the net. We had to lift the top fish out of the water, net the bottom fish, then lower the top fish into the net – not very elegant. A quick snip off the end of the leader and a new Perfection Loop corrected that. Rigged gold Shad King and custom green shad dart at top. Flicker, Kastmaster, silver Shad King, Len Thompson No. 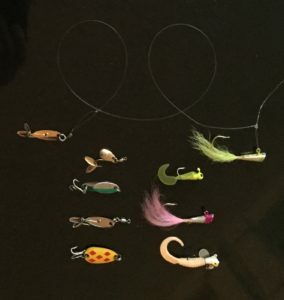 6, 1″ curly tail grub, custom pink shad dart, Roadrunner with 2″ curly tail below. Shad darts, small curly tails, Kastmasters, and many other diminutive jigs and spoons are good choices for hickory shad. You can vary the lure style, color, or weight depending on the conditions. Wind, water clarity, current speed, depth, and personal preference all play a factor. Spoons are best placed only in the bottom position. The wobble and spin of a spoon is restricted at the upper position and can also cause some tangles. Jig type lures perform well in either position. My usual lure offering is a shad dart at the top position and a small Shad King spoon at the bottom position. The shad run begins in the south and continues roughly, sequentially northward. Now may be the time for tandem rigging shad on your home waters. 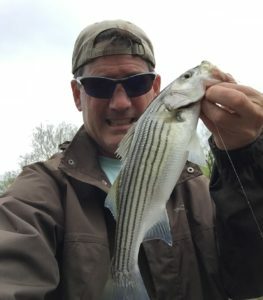 This little rockfish grabbed the shad dart at the top of my tandem rig. Bass, pickerel, crappie, perch, sunfish and other species will find a shad rig appealing too.